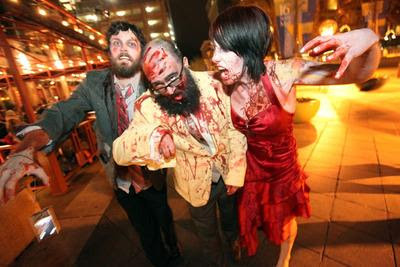 Organizers must fork up a hefty “clean up” fee of $1,000 resulting from an annual zombie walk in Denver, CO. The fee, which comes from “nine hours of using a power washer”, seems a bit extreme if you ask me. The Downtown Denver Partnership (who manages the mall where the walk took place) considered the fake blood grafitti and contacted that particular department to clean it up. Isn’t fake blood meant to wash off easily? Daniel Newman, who was organizer of the event, did his part by contacting area law enforcement and other businesses prior to the event. He even secured a permit from parks and recreation. Newman had a full cleanup crew make the rounds that evening as well as the next morning. Check out the full article including more words from Newman and a full slide show of the event by clicking here. Okay, fake blood varies in its difficulty to remove, but come on! Thats just blowing it out of proportion!